This is the first gingerbread bridge I made. Every year we make our gingerbread village, and I thought it would be nice to have a bridge, so this is what came out of it. It looks really nice in the village. 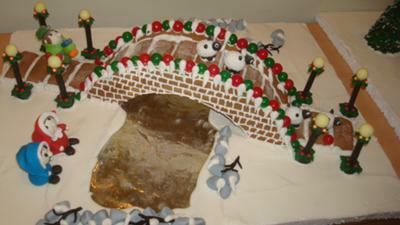 The bridge is made out of gingerbread, the street lights, the sheep, rocks, and people of rolled fondant. To make the river I used caramelized sugar, and icing for the snow. I concur on the water. That is so life like in the picture that it has to be real. That is a beautiful bridge! The water looks so real!